MUFF WIGGLER :: View topic - HERTZ DONUT MARK III - shipping now! HERTZ DONUT MARK III - shipping now! Complex digital oscillator with unison detune, programmable 3x4 modulation matrix mixer and external audio modulation input. Intricate arrangements of phase distortion, thru-zero frequency modulation, and complex oscillation are instantly morphable and recallable through a voltage-controlled preset manager. Suitable for genre-targeted sequenced basslines, synthesis of stone, glass, and steel tones, and simulation of the acoustic properties of industrial machinery. The Hertz Donut Mark III’s main oscillator shapes its timbre by distorting the phase of a waveform lookup ramp, offering a linear growth of brass overtones from a simple sine wave whilst performing with exceptional clarity under heavy frequency modulation. The simulated resonance peak familiar to enthusiasts of phase distortion is also present and continuously controllable. The beloved “fractal” distortion from previous iterations of Hertz Donut is simultaneously available. The three waveform parameters operate in a modeless timbre space fully morphable under preset and shared manual/CV control, exhibiting stunning spectral evolutions that are intensified through the module’s internal modulation bus. The fold knob is assignable to control one of the three parameters at a time, with the CV input also assignable to any of the three. Two sinusoidal modulation operators are mixed to four modulation destinations with an external audio input. The operators may be locked to several precise frequency ratios of the main oscillator, or set to be otherwise subordinate. The three sources may modulate each other’s frequencies, or the amount of phase or fractal distortion. A plethora of control voltage inputs allow full control of the patch, reacting within a +/- 10V range. The first operator has a calibrated 1v/oct control voltage input and fine tune control, for use as an independent oscillator augmented by the modulation bus. The modulation mix is placed under the influence of a master control, so that a single knob and CV input control the degree of modulation in the entire module. Each sound that you design will have a unique and intense behavior of this modulation control. The preset manager stores 8 entire panel/menu states for instant recall under manual or voltage control. The control can also cause the creation of elegantly randomized preset data. The preset manager can be placed into a morphing mode where it assumes control of the various parameters, smoothly fading between entire panel states and generating very complicated sounds that are not easily described. The unison detune function mixes in a nearly identical copy of the sound with slightly offset frequency, or optionally in octave or fifth intervals. 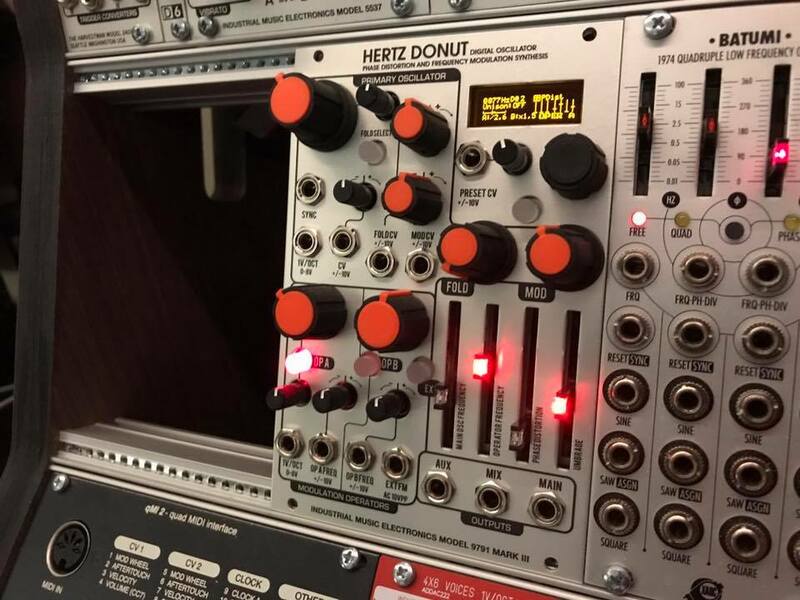 The Hertz Donut operates at 96khz for a minimum of sampling byproducts, able to consistently and competently generate ornate digital beauty and jagged swaths of sonic mayhem. The auxiliary output presents the output of one or both modulation operators, also with optional unison applied. The nearby mix output is an analog sum of the Main and Aux outputs, facilitating parallel FM algorithm construction. 17 HP panel size. Perfect, genuine, complete, crystalline, pure. Is this still on track for a release soon? Control has nothing about it and they’re usually on top of it. scott just dropped off all the necessary parts at darkplace today. so, i'm guessing they'll start building them soon. per the comments in this instagram post. also, he's doing another talk at modular 8 on the 19th of january. details coming soon. I hope it's the Andore Jr/Single Andore. the talk will be live streamed on our youtube page january 19th. you'll have to wait until then to find out. MusicStore (Germany), where i preordered the HDmk3 updated their shipping date today from January 7th to February 23rd. Feels a bit like a sales trick by musicstore to change the shipping date from late February to late December pre christmess, then to early January after christmess and after collecting all the pre-order money back to late February. Woooooo! Just pre-ordered from Perfect Circuit!!! wow.. preorder already? they haven't even started building them. I mean, if they have all the parts in, it shouldn't take *too* long. These days it seems like the thing that takes the longest is getting all the parts to come in the first place. Those resistor and capacitor wait times are killer. Just pre ordered mine, almost a year and four months since I've bought a euro module, that says something. I just ordered my Hertz Donut... the Mk I version. Saw a great deal one one and couldn't pass it up since my setup revolves around swapping out 3 module "slots" to keep things from getting too static, with one of them being taken up by the HD mk1&3 and the PH mk3. You saved a bundle of cash from burning in the fires of euro-hell?